BurnAware a Blu-ray Disc burning software comes in Free, Home and Professional packages. BurnAware Free is a free CD, DVD, Blu-ray Disc burning software. It is ideal for users with basic disc burning as taking backup, creating data, audio, MP3 music, DVD-Video discs and burning images. Free, easy to set up, it enables you to save your files to disc quickly and provides clean, flexible interface to help you complete your burning tasks much faster which even supports Windows 7. And with the help of BurnAware Home edition helps you to copy your CDs and DVDs with digital photos, documents, games, movies and music easily. You can even compile and burn bootable discs and disc images with this BurnAware Home edition. BurnAware Professional is the professional’s choice for complete CD & DVD media duplication. 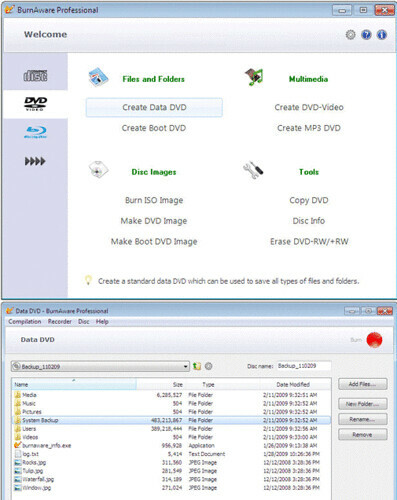 Apart from standard features BurnAware Professional offers a wide scope of advanced functionality, allowing you to duplicate CDs and DVDs, make exact copies of discs on your hard drive and write to multiple drives simultaneously. I have tried their free version, easy to use and fast, let me know your thoughts about the same.